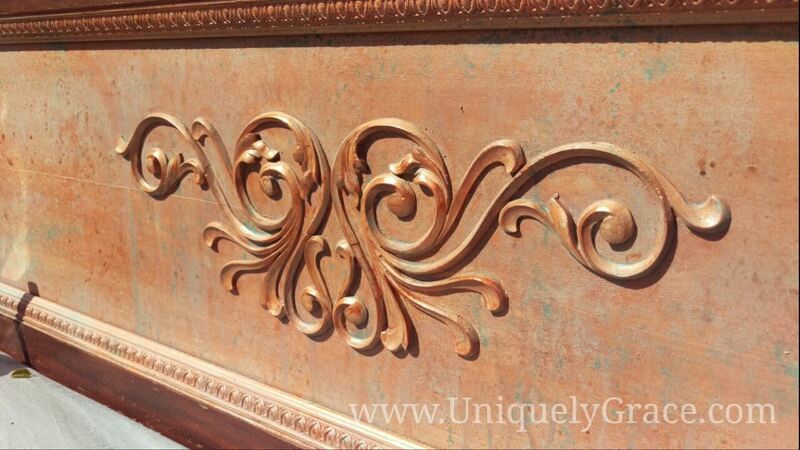 Vintage Mahogany Headboard Rustic Old World Faux Copper Patina! Meet Venus! 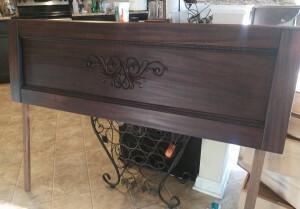 She is a stunning, vintage mahogany full sized headboard that has been refinished twice in a week. Yup, you read right. 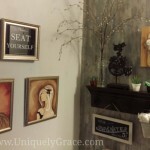 I didn’t like what I did the first time and needed something more uniquely, well, Grace (me). Hehe. So let me tell you a bit about this unappreciated beauty. I found it in a dusty ol’ second hand shop… you know the kind where you have to dig to see the best stuff and you only pay cash. I found her in the back corner entangled in some floor lamps and metal bed frames. I began digging her out, inquiring how much he wanted for her and a metal bed frame to go with it so she would be ready for a box spring and mattress for my next customer. She had pieces splintering off around the edges after being tossed in with those metal pieces and really just needed an over all sanding and makeover. 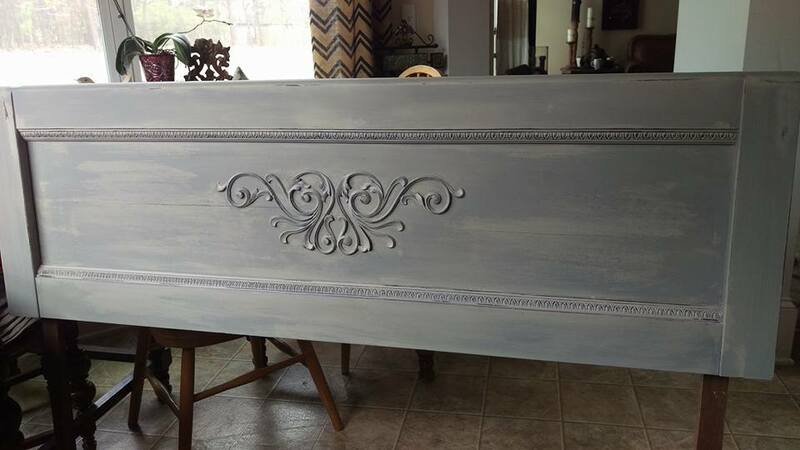 After cleaning her up I found some inspiration of a beautiful grey chalk paint distressed to reveal a taupe, and some white and then some dark wood. So I began the layering process…. dark wood sealer to prevent any bleed through from the mahogany wood, then a coat of white (should have done two), then a coat of taupe, then a coat of a beautiful warm grey. Before I could proceed with this process… I got a phone call. NOTE TO SELF: don’t paint when upset! I really didn’t like it all to much but decided to sleep on it and take a look at it in the day light. When I awoke the next morning I noticed it was not so bad as I felt it was the night before so I decided to antique it with a white glaze… I left to run errands as the glaze dried and came back to this…. 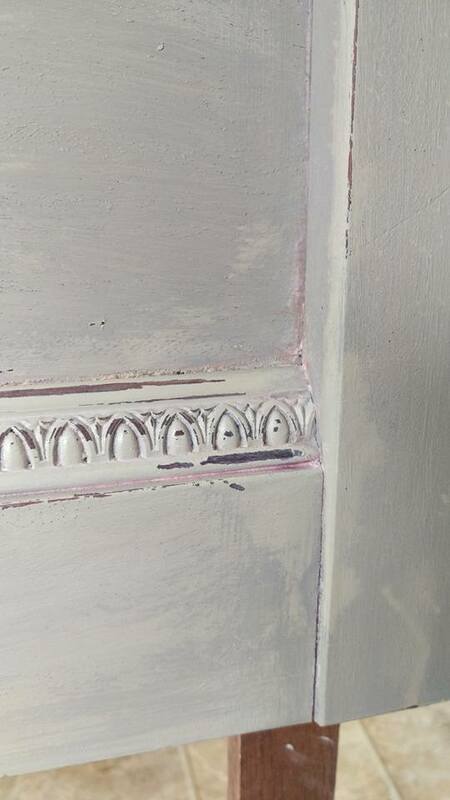 in the corners the mahogany bled through into the white glaze leaving a PINK glaze all around the edges… PINK! Not only that I realized why I didn’t like it the night before. 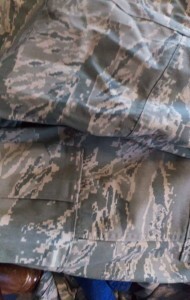 It was one color shy of my hubby’s camo gear for work. Now don’t get me wrong I LOVE my man in uniform but these colors were not the “vision of elegance” I was trying to achieve with this piece. So what to do now. 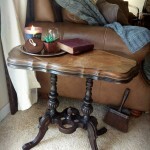 Well a dear friend who also refinished furniture suggested a patina… which lead my bran storming to copper…. but I didn’t want the grey/taupe frame around it. On this headboard I was working with Terra Bella Paints & Finishes. It has a Stone color base distressed to reveal Jute the color under it as mentioned above I hated it… first time I ever hated a piece enough to redo it. LOL! 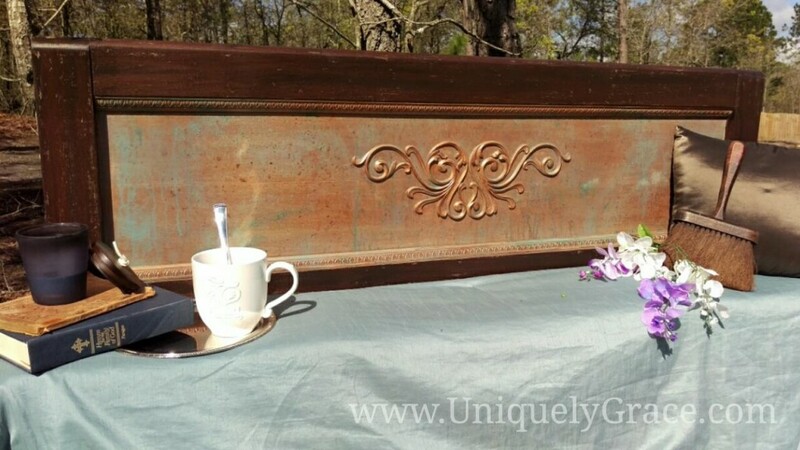 I misted the center of the headboard with watered down chalk paints: Yellow Rose, Sunset, and Canyon then blended with a dry brush giving the base color some warmth and random color changes to go under the Copper Penny Shimmer layers. 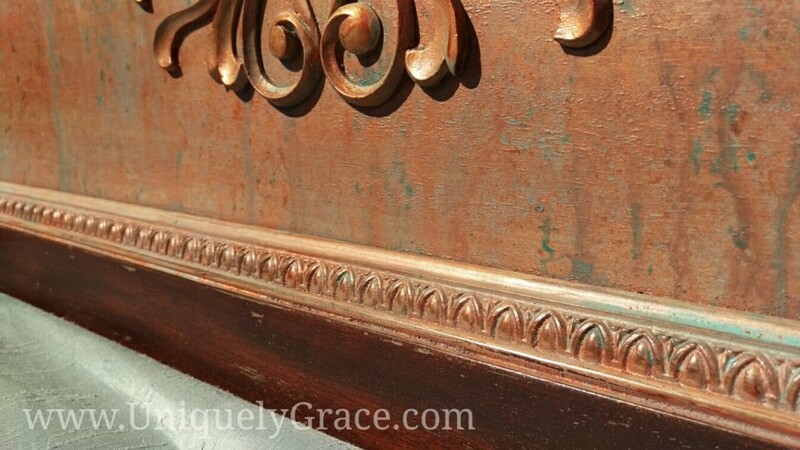 I then added 3 coats of Copper Penny Shimmer to the headboard and oh wow… that transformation was amazing. 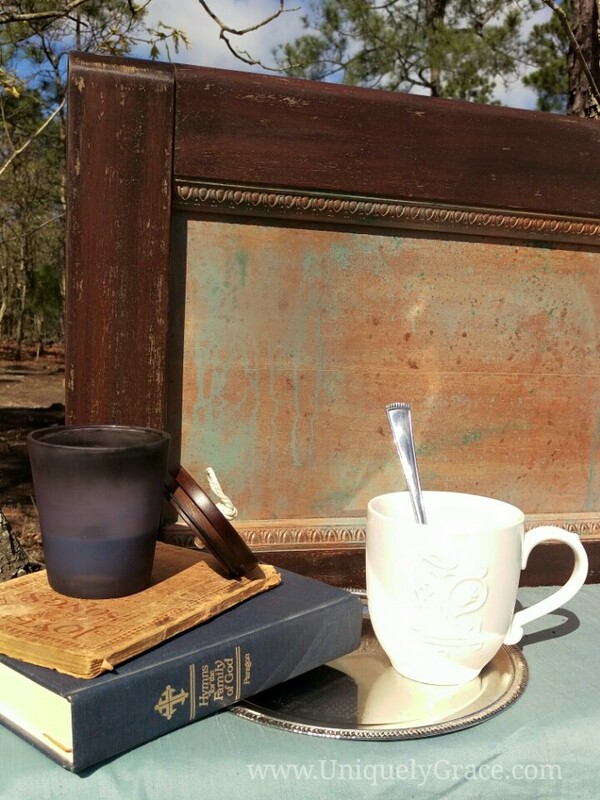 The misted with more watered down colors of: Tranquil Sea, Aquamarine and Cocoa Liquid Wax. While these were still wet I splattered it with rubbing alcohol so flash dry spots… waited a couple of min then tired it upright instead of flat and let gravity drip the patina down. Once dry I added more copper penny with my finger on the applique and molding. The frame of the headboard was just painted last night, so I wet sanded the paint back off leaving bits and the sealed it with two coats of Ebony Liquid Wax. This item is for sale and can be found right here in my shop, please message me for shipping quote if you are not near Columbia, SC. Thank you so much for viewing this Headboard project… flip/fail/flip. Hope it is helpful and if you have any questions I am happy to help. Leave a comment below.